Standing atop the hill in Bellahouston Park, the wind swirling the leaves around our legs, the rain falling in quantities sufficient to sink even the most buoyant of spirits, it seemed that the universe had abandoned its usual indifference and instead had become one with my dark mood. 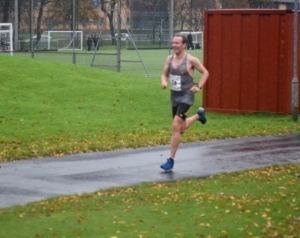 The last thing my body wanted to do was two and half laps of the park at speed, my muscles were dull when they should have been taught, my ligaments tight when they should have been supple and my comportment weary when it should have been effervescent. Nevertheless, while my time on this earth is but a grain in the sandpit of eternity, I resolved to put it to best use. After all, until one is committed, there is hesitancy, the chance to draw back – the moment one definitely commits oneself, then Providence moves too. All sorts of things occur to help one that would never otherwise have. Boldness has genius, power, and magic in it. Like the tiger’s claws reaching towards the crescent moon, it was an aggressive effort from start to finish; at 3km I idly wondered if I would be able to maintain the prevailing momentum, at 5km the answer was no clearer but the rain, wind, mud and vigorous effort combined to overwhelm all my sensibilities, leaving only a relentless focus on the task at hand, at 8km the cold, hard conviction, wrought in the forge of the breathless, straining exertion of going over the hill in the park for a second time that afternoon, had emerged that yes, I would be able to make it to the finish. Well run, and we’ll said, you fine chap. But where was your Westies vest? Hidden in your comportment?! Thanks John! If I knew where my Westies vest was, I would’ve been wearing it! WH Murray would be proud, splendid imagery! I can feel the rain on my face, wind in my hair and mud caking to my calves… More of this please.